Plenty of philosophies and religions out there are against the accumulation of stuff. Go sell all your possessions, they say. Materialism doesn't lead to happiness, they say. Stuff just gets in the way of things that are truly important. The craziest part? I still want more. There are anime series I'd like to own and comics I want on my shelf. I plan on getting more geeky posters to put up on my wall. I've got cosplay ideas for future fan conventions, and I assure you they'll require plenty of time and money to assemble. How could anyone be a fanboy/fangirl and adhere to any of the philosophies and religions that eschew having and collecting stuff? Forget lying and murdering; Warhammer is a real sin. As I see it, it's impossible to be an honest-to-goodness fan of anything without collecting at least a little bit of fandom-related stuff. Clearly, some fandoms such as Magic: The Gathering and even socially acceptable hobbies such as cycling and sailing require stuff. Sure, you can argue that a few hobbies and fandoms require no stuff whatsoever--swimming doesn't technically require a bathing suit, after all--but by and large, there's always a thing you need, however small or inexpensive, to be a fan or hobbyist. Even if you're fully convinced that having and pursuing stuff is wrong or a hindrance of some sort, the positive impact of stuff cannot be ignored. I've made friends as a result of playing Magic: The Gathering. Are friends also stuff and subject to the same reprehension? Cycling is an excellent way to stay in shape; is being healthy against the rules, too? Plenty of people feel that being alone in nature is the perfect way to connect with divinity or one's spirituality; is sailing away from the hustle and bustle of everyday life truly a bad thing? Perhaps a certain degree of stuff is acceptable. Maybe it's the overaccumulation of stuff that's harmful. One or two lightsabers can be fun, but do I really need enough to spell out the acronym for the name of this blog? I rationalize it thusly: I don't need all the geek stuff I have. Truth be told, I don't really need any of the geek stuff I have. But I like my stuff. Geek stuff makes me happy. It allows me to de-stress and maintain my sanity in a stressful time of unemployment; it's art that brightens up my room; it's a source of creative inspiration; it's a way for me to bond with friends and family; it's a constant reminder of how fortunate I am that I can afford so much stuff--in some strange way, having an overabundance of stuff keeps me from taking it all for granted. Maybe I would be a better person if I sold every nonessential thing I owned and gave the money to people in dire need. Maybe I'd be happier if I parted with everything locking me into a materialistic mindset. Maybe. My goal is to find a good balance, to enjoy stuff but be able to live without it if tragedy strikes, and to collect only what I truly want and will use. Stuff is a part of who we are, no matter how large or how small. As long as our stuff is only a mere part of who we are, and not our whole being, I think it's entirely possible to have stuff and be completely productive and content with our lives. 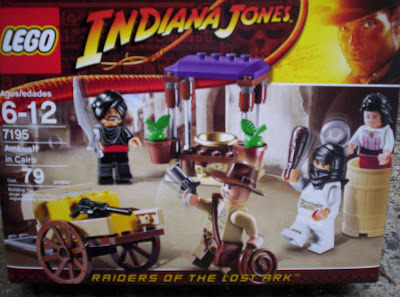 Honestly, I'm just trying to justify spending $12 this weekend on a LEGO Indiana Jones set that I don't really need. I used to justify lego set purchases because they had new parts that I could use to upgrade old spaceships. I still think you look a lot like the prequel Obi-Wan, so much so that I wondered where you got a pez dispenser with your head and why it was with the Star Wars dispe-- ooh! Since I started doing kendo a year ago, I've probably spent close to a thousand dollars on it. Jacket, hakama, armor, shinai, grading fees, insurance... yeah. With enough creativity, even Indy can be turned into a spaceship. Or something. 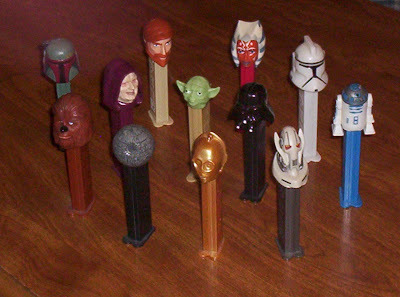 To tell the truth, I felt very odd the first time I loaded up the Obi-Wan Pez dispenser because it seriously looked like a Me Pez dispenser, and I've never eaten out of my own neck before! I shudder to think about how much I've spent on comics, which I've been collecting for about as long as you've been doing kendo; I figure the numbers are a little smaller, but probably not too far off. Did you ever find Kingdom Come? Negatory; I will, however, make it a point to look specifically for Kingdom Come the next time I'm out buying comics. Of course, I've probably mentioned it so many times that you'll be terribly disappointed when you actually find and read it. It's still a great story, though. News! I now have Kingdom Come. The next step is to pester me to start reading it.